This article is about the village in Cambridgeshire. For the Roman fort on the Antonine Wall, see Bar Hill Fort. For other uses, see Barrhill (disambiguation). 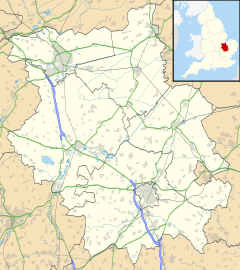 Bar Hill is a purpose-built village with a population of 4,000 about 4 miles (7 km) northwest of Cambridge, England on the A14 road. The Prime Meridian passes just to the west of Bar Hill. Planning for the village began in the late 1950s to alleviate the housing shortage in South Cambridgeshire, and the first residents arrived in 1967. The village grew rapidly and by 1975 there was a population of 1,673 in its 599 homes, though it was only 40% of its intended size. Expansion continued in the 1980s and in 1989 the final house of the original plan was completed, 23 years after building had begun and 15 years after its planned completion. The population was at that time over 5000. Its name originated from the fact that it was built along an old Roman Road that had a Toll Bar/gate (the "Bar" part) which was used in the local area as the farm's name, Bar Farm. The farm house still remains next to the village school. The toll gate was also located roughly near this building. The village was built on or around one of the many hills in the area, hence the name "Bar Hill". It is accessible on the B1050 road, off A14 exit 29. On 8 August 2014 the village came to national prominence when over 100mm of rain fell in a period of approximately 30 minutes causing many parts of the village to become flooded. The village has a shopping mall (with a large Tesco Extra supermarket as anchor store), library (in which, unusually, a post office is also located), primary school, multi-denominational church (rebuilt in 1991) and a pub called The Fox. A skate park was built in the village but has largely been demolished. There is also a championship 18 hole golf course and hotel. The village also has two fields (one large field known to locals mostly as "The village green" and the smaller school playing field located near the farmhouse) which are used to host sporting events and council events such as the annual village féte. It has a cycle path to Dry Drayton, known as The Drift. There is also a footpath that leads to the small village of Lolworth. Bar Hill was originally contained within a ring road when it was first developed, but with the expansion and development of the area, it began to spill out. For example the "Gleneagles" development overlooking the golf course. ^ a b "Bar Hill - a short history". ^ "BBC - Clean-up under way after flash flooding". ^ Chappell, Bob. "History". barhillchurch.org.uk. Retrieved 2016-04-06. This page was last edited on 30 December 2018, at 13:44 (UTC).